Last night after dinner a few of us took off to walk the streets of Kolkata. We usually get taxis but tonight we decided to walk a little in search of sweets. 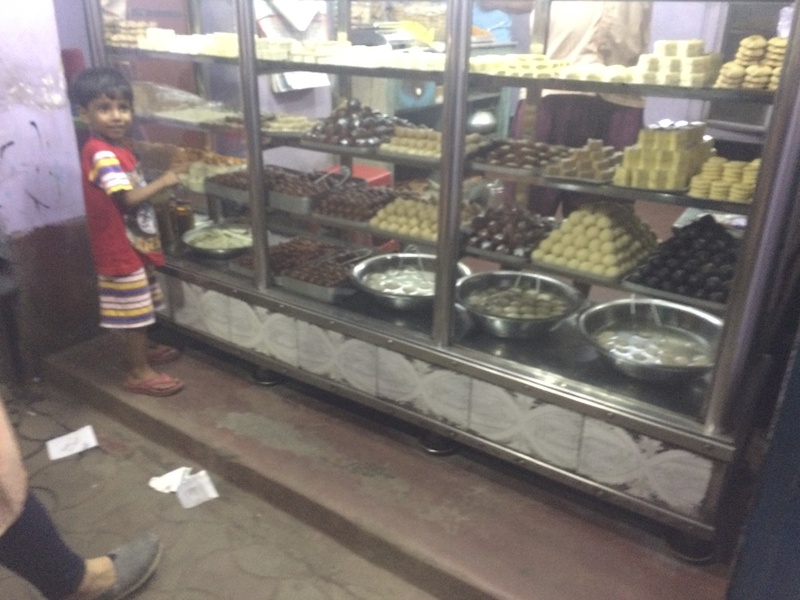 We have been warned to stay clear of any street food (and after watching how they prep I am fully in support of this), but Kolkata is known for their desserts and we figured these should be okay, right? I know, dumb, but we did it anyways. At night is when the streets come alive in Kolkata. The scorching sun has taken its rest and the cool breeze makes its way through the town. My eyes dance. My heart soars. I speak little as I take in all that my senses can absorb. Silence. Breath… Don’t forget this, Alisa. I stopped to take a mental picture. The street stands lit with strands of miniature twinkle lights, as if decorated with glowing rubies and sapphires and emeralds. The counters crammed with Darjeeling and Masala Tea. Bowls sautéing up foods whose savory aromas seem to momentarily cover any foul sewage smell that may linger close by. We pass by windows- counters, one after another. Scarves. Shoes. Sweets and more sweets. My senses were on overload. Colors dancing before my eyes. Smells lingering around me, competing only with sounds that my ears count not shut out even if wanted them to, and yes, there were plenty of times I wanted them to! The shriek of an army of horns. Taxi horns. Horns honking endlessly, one picking up where another left off. Endless. Loud. Like, beyond loud. As we walked, I couldn’t stop smiling. Partly at the thrill of it all, feeling my heart race as we walked – a foreigner and a woman no less. It all had a slight edge of danger to it and I loved it. It made me feel alive. But, I also loved observing the people, people of all ages, oodles of people, just talking and laughing and yelling. Not a mean yelling, but more just how they communicate. Men threading themselves through swerving taxis as they crossed the street, little children running everywhere. Groups of men sitting around, talking loudly, others in a circle on the ground playing cards. Women walking by with babies tied firmly on their hips. The streets were alive with life. Real life. Real relationships. Ahhh….this is how life should be, I thought, as I watched this movie play out in front of me. I wish I could capture this all. This love. This togetherness. This life. Living so closely to another. Yes, the poverty is still there. The dangling live wires. The rats. The trash- everywhere. But once your senses adjust, these features become dimmer. They begin to fade and what emerges is a work of art. Live paintings. People. Stories. Emotions. I wonder, dear sisters, if it would have ben just as beautiful without the contrast of that which is not? I need to process this idea because I think there is something to it. I remember feeling this same way when I visited South Sudan. The pain and suffering, the difficulty of life, painting a dark backdrop on the canvas before me, allowing the joy when they sang and danced to really pop, to shine oh so much brighter. Perhaps its the darkness of the backdrop that intensifies the light. The darker the backdrop…. The brighter the light. Light. Light. Piercing rays of hope. Blinding rays of joy. Penetrating rays of peace. Perhaps, dear sisters, this is for us as well…. The darker the backdrop- the trials- the hardships- the suffering, the brighter the light we may experience. and more intensity of Jesus.